This is "quickie" ketchup. I don't always get around to making ketchup with a recipe. When we had our homemade burgers the other day, and we realized that the ketchup jar was about empty, one daughters asked, "mom, can't you just make some "quickie" ketchup?" Well, of course I could. It's what I've been doing for the past several months, in lieu of making a big batch of ketchup on the stove. "Quickie" ketchup is canned tomato paste, sweet pickle juice, soy sauce and water to thin. That's it. It's all made to taste, primarily tomato paste, with just a couple of splashes of sweet pickle juice and soy sauce, then thinned to the right consistency with water. I don't cook it, but simply stir it all together. It keeps in the fridge for about 3 weeks, so I just make enough for a few meals at a time. I love that it is mostly tomato paste (which counts towards veggie/fruit servings), and uses up some of the sweet pickle juice left at the bottom of the jars, when the pickles have been consumed. 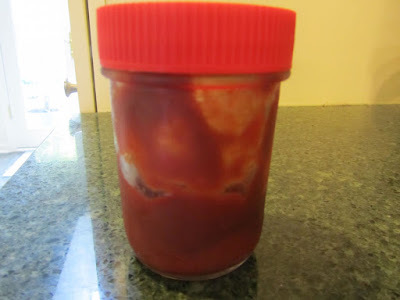 We do a little more complicated, but still pretty quick, ketchup (also from canned tomato products) around here when we do the Specific Carbohydrate Diet, and then just freeze it in a few half-pint jars. This is potentially another "I didn't know you could make that" product, don't you think? Although I remember Doris Day canning ketchup in the old movie, The Thrill of it All, from when I was a kid. I'm going to have to search for that movie! I loved those old Doris Day movies, and I think my family would enjoy them too! It really isn't so long ago that people made their own ketchup. I have a cookbook, era 1940-50 with a couple of recipes for different ketchups. I often make extra to freeze, but just have not gotten around to making a full batch of ketchup, lately. Just one more chore on my list of things to get to. One thing about my homemade ketchup vs commercial, I never add as much sugar, so am leery about how long it will keep. Freezing is a great way around that, just keeping in the fridge what we'll go through in 2-3 week period. The Thrill of It All is a silly old film with James Garner (one of my favorite actors.) It's probably my favorite of her romantic comedies, except Teacher's Pet. (April in Paris is my favorite of her musicals, and The Man Who Knew Too Much is probably my favorite of her dramas, though Midnight Lace was interesting), and our kids think it's funny, too! :) It's silly but not quite as wildly slapstick as some of her other later movies. The SCD ketchup uses honey instead of sugar, but a lot less, like you; so that was our reason for freezing, too! Also, what I make comes out to maybe 3 pints, so probably not worth all the water and fuss for canning-- and still not to much to tuck away in the freezer. I adored James Garner in those older movies! My daughters and I are going to the petting zoo in just a bit. Everyone grew up, but I still like those animals! And the girls agreed that it's always a fun thing to do, no matter your age! I might have to try this -- I'm kind of appalled by how much sugar is in regular ketchup but straight up tomato paste doesn't appeal to me at all. I'm a hard-core Heinz fan and that has held me back from trying to make ketchup from scratch in the past. This would be a smaller commitment of ingredients than canning a whole batch. I say go for it! There are copycat recipes online that mimic the major brands of ketchup. I'm pretty sure there's a Heinz copycat recipe. And yes, try just a portion of a batch to see if you like it enough, then work at tweaking it till it's just right. My family are all big ketchup lovers, and I was hesitant at first, making my own. But as it turns out, they are happy as clams that I can always make more. Yeah, straight up tomato paste does not sound appealing on a burger, does it?! I think Dr. Oz recommended just tomato paste. Healthy, sure, but the flavor just doesn't work for me. I will have to lookup those copycat recipes. Really I think I was stuck on the idea of making a whole batch and then hating it. The simplest solution frequently eludes me (like making only a portion of the batch to test it out). Good luck with the copycat ketchup! Great job on making the dinner rolls and buns!! Once you learn something, then do it, it's yours forever. You will always know that you can make your own burger buns, from now on. Yes, I freeze the leftover burger buns right away. I typically make a batch of 12, we use 5, and I freeze the remaining 7. Then I can take out however many I need and thaw the afternoon I plan on using them. We used burger buns tonight for barbequed pork on buns. My husband has tried straight up tomato paste on food as a ketchup substitute and it is not good. But eating high fructose corn syrup (which is in most ketchup) and lots of sugars are also not good. Hubby watches labels like a hawk so I have to see if pickles have high fructose corn syrup in it or not. I have a bit of tomato paste frozen so I will try that. Our family loves ketchup also but trying to find one that fits hubby's liking is becoming increasing difficult. Another kudo for eating homemade meals! The first time I made ketchup from scratch, I enlisted the tasting help of one of my daughters. I don't care as much what the ketchup tastes, like, but I felt the rest of my family would. So, having one of them be my taste-tester was the way to go. I added ingredients and would ask her how she liked it so far, then adjusted the seasoning. This worked very well for us, as I was able to make a ketchup that had only cane sugar (no corn syrup), and it appealed to all of their tastes. I use the pickle juice from home canned bread and butter pickles. If you don't can pickles, yourself, do your folks do any canning, that they could save a jar of just the pickle juice for you? I just googled Nalley Sweet Gherkins, and at least in that brand it's sugar, NOT corn syrup. So you may be in luck! I stocked up 20 bottle of Del Monte brand ketchup because someone in our family didn't want any other brand. Then suddenly he didn't need or want to use it as often so we still have about 15 bottles which will "expire" in a few months. I don't think I will ever stock up like that anymore, but catching the ketchup on sale made a huge price difference so I took a chance. I'm thinking I should freeze the bottles and not wait til November. Ketchup past the expiration date looks and tastes pretty nasty. After this I'm not going to buy ketchup anymore and try to make it myself. Thanks for your quickie recipe, and I have another one I've saved from the internet that calls for vinegar/sugar/molasses/mustard....so sounds like your sweet pickle juice and soy sauce is a good equivalent. definitely, freeze it! You may need to transfer to other containers or even ziploc bags, but you can (and I do) freeze ketchup. You may NEVER need to buy ketchup again, LOL! It will keep frozen for several years. Your ketchup surplus sounds like my jam and jelly surplus. We were plowing through 40 small jars of jelly or jam per year, for several years in a row. Then in one year, it seemed no one was ever using jam or jelly anymore. I'm using up that surplus right now, and will do an inventory later this month to see if I need to make any at all for the next year. You can use the ketchup in a variety of sauces and dishes, too. Like in homemade baked beans, or for making 100 Island dressing/dip for carrot sticks. Or for glazes, mixed with spices, vinegar, garlic etc for meat. I think my homemade version of plum sauce uses a combo of ketchup and plum jam (plus some spices). Thanks for the tip....you're right it may not be a good idea to freeze the bottles...maybe a few, but imagine the space it will take up. So freezing it in ziploc bags is a better idea, glad you made mention of this before I dumped all 15 bottles in the freezer lol My goodness with your jam and jelly surplus!!.. 40 jars is a lot and more than I could imagine. We use the ketchup to make Oriental Salad Dressing (almost like a thousand island dressing) that is a hit in our home, but even that has slowed in recent months. We loved it on cabbage/lentil sprout salads, then when our lentil supply ran out, I came across a Kim Chee noodle salad recipe that called for Oriental dressing, so that's how we've been using our ketchup. Baked beans is an excellent idea and I do have lots of dried beans in our pantry. I remember my mother canned a huge batch of ketchup when I was a kid. It was a lot of work and I don't think she ever did it again. And as I have mentioned before, we canned and froze EVERYTHING. So she really must have thought it was not worth the effort. So we used store bought. However, ketchup was used very sparingly in our house. I wonder if the recipes for commercial ketchup have changed over the decades? I'm guessing it's sweeter now than it was back when I was a kid. And I bet your mother's canned ketchup was completely from scratch, peeling tomatoes, cooking down fresh produce, standing over an open kettle, stirring for a very long and sweaty time. I have no idea what the price of ketchup may have been back then, but your mother must have figured that making it from scratch was not worth her time and work. I have felt the same way about home canned tomatoes, or using fresh tomatoes to make salsa. All of that extra work of peeling tomatoes is just so much of a chore, not to mention the raw hands I have afterward from handling the tomato juices.